By using the free Medical Appointment Card you will be able to keep track any future doctor appointments with ease. The simple template document will appear as an ordinary informational card, with your doctor’s contact information and the date and time of your appointment listed dead center, so you can’t miss it. Customizing the free template is also easy, with just a few mouse clicks; you never have to memorize your doctor’s contact information ever again. If you want to learn more about this template and download a copy for yourself, just follow the list of instructions below. 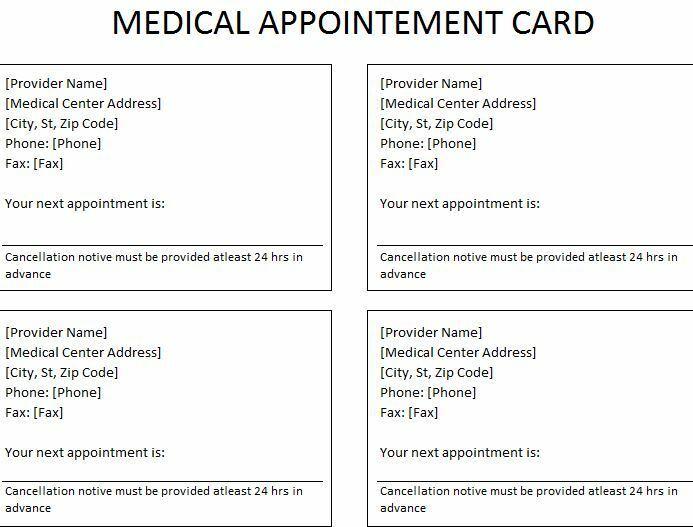 To download the Medical Appointment Card template file directly to your computer, just click the link at the bottom of this page to get started. Next take the opportunity to look at the information required by each card. It will be more or less the same, unless you use multiple doctors. Go through the top portion of the cards and enter your doctor’s contact information, along with his office and their information. Start by entering the name of the company/office, the address of the office, phone, and finally the fax. If you want to incorporate other information, like office hours, you can easily change or add something new by clicking in a cell and typing it. The last step is simply to enter the date of your next appointment on the indicated line of the card. If you want to include information like office hours in another section, you can use the small space below the appointment line as well. Last, but not least, just print the document by selecting “File” then “Print” at the top of your screen to create your very own document. It’s up to you whether or not you want to write the information out on the sheet or enter it on your computer before you print.